We get asked this a lot! If someone buys Venture Jet with Shearwater then yes, there will be jet boat trips in new hands. If no-one comes forward to take on the jet boating mantle then unless someone comes in with an entirely different business and a boat unlike anything currently operating in the UK then no, there won’t be any more jet boat trips with the sort of fun manoeuvres and cave exploration that we’re known for. 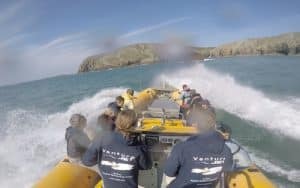 There are one or two boats in Pembrokeshire with jets so they have the advantages of no propellers, which is great news for wildlife but they are not designed to do the fun stuff – they don’t have the right hull or jet to do that. Even other Ocean Dynamics jet boats aren’t necessarily designed to do the sort of manoeuvres our passengers enjoy – you need the right mechanical set-up: Shearwater was designed and set up to be able to spin on her axis and to brake under power, which is not normal behaviour for RIBs 🙂 . If you want cave exploration, wildlife watching and then Hamilton turns and power-braking then we don’t know of anyone else in the UK doing that sort of thing. Shaun White, who designed the original Ribworker jet boats and set up Ocean Dynamics, used to visit his boats around the world and I can see us doing this in retirement 🙂 . So yes we really are retiring from full time jet boating on 3rd September this year and unless someone comes in to take over the helm, then the Wet and Wild jet boat adventure will retire with us. While we still have Shearwater we may well do some limited group trips and charter work but we will not be running scheduled trips. We’ve been very touched by the number of people asking how to book these trips. We’ll keep the website and telephone number – we’re not going to vanish from the face of the ocean – but we’re not guaranteeing trips beyond this summer. Of course a new pair of hands may be very happy to welcome you aboard 🙂 . Right now we’re focusing on enjoying the summer at sea with our passengers, exploring as only jet boats can. See you out on the water!